Today marks a week since we packed up our car and drove out of Vancouver. It’s just us and the open road for the next few months, before flying to Central America. 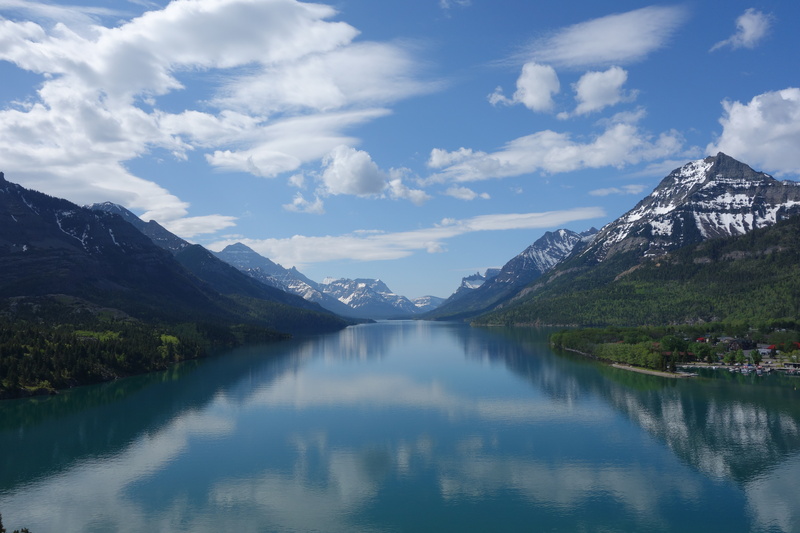 We kicked things off with a whistlestop camping tour of Waterton Lakes National Parks, in Alberta, and Glacier National Park, in Montana (pretty much the same park but on the US side of the border). I’m pretty sure that no matter how much time you spent in these parks, it wouldn’t be nearly enough. After exploring, hiking, and even cycling the east and west sides of the park, I can honestly say this part of the world has some of the most beautiful landscapes that I’ve ever seen. Early June is still spring here and considered the early season. 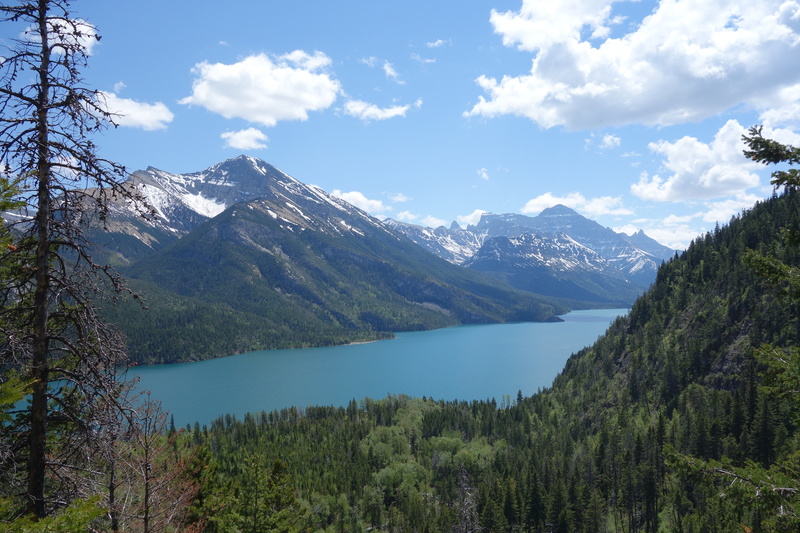 Unfortunately, quite a lot of the well known hikes and roads (such as Iceberg Lake, Cracker Lake, and the Going to the Sun Road in Glacier; and the Crypt Lake and Carthew-Alderson hikes at Waterton) were closed due to snowfall. On the plus side, the wildlife was out in force — with babies! And there were barely any other tourists around to bother us as we took it all in. 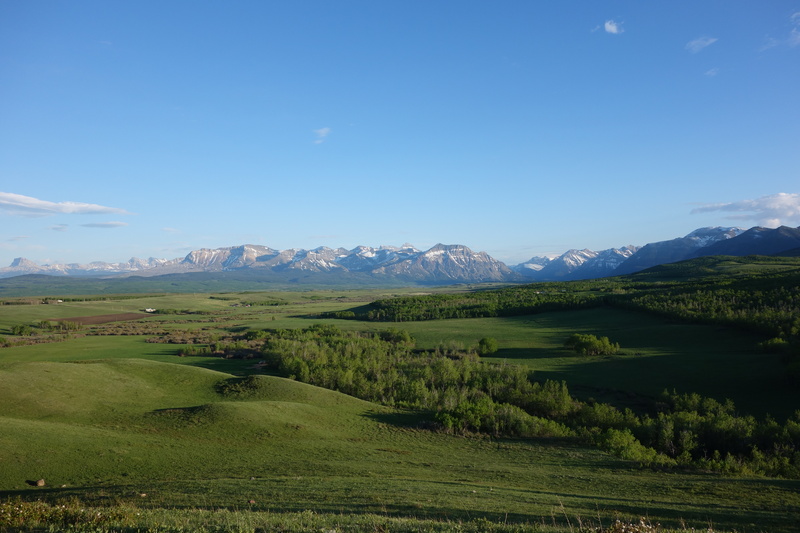 We arrived fairly late, driving in from the west to be greeting with enormous rocky mountains that seemed to sprout straight out of the flat, Albertan plains. 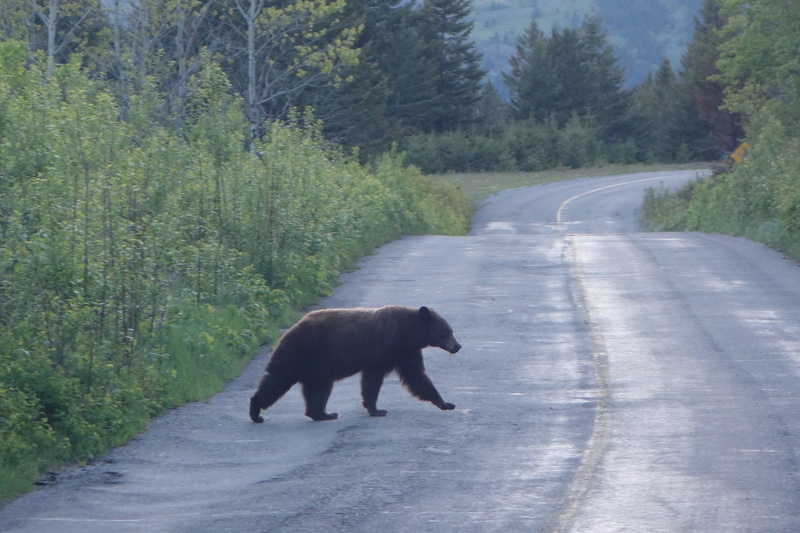 Driving into our campsite in the late evening sunlight, we almost ran into a bear that was crossing the road. It was just a little too close to the campground for comfort, so we definitely took the “bare campsite” precautions seriously! Like it’s more famous cousins Banff and Jasper to the north, Waterton Lakes National Park has it’s own cute little town in the middle of the park. There’s also a beautiful old hotel on grassy knoll overlooking the town, where you can have your own Sound of Music moment as you look out at mountains and lakes. We didn’t spend a lot of time in town, except for when we had an unexpected downpour that delayed the start of our hiking one morning. Our first hike to Bertha Falls — not far from town — was fairly impressive, but it turns out kilometres of snow-packed, steep trail is harder than it looks. We ended up turning back before reaching our destination of Bertha Lake, but the scenery was still worth it! We also checked out Red Rock Canyon (in the rain) and the still frozen Cameron Lake. More exciting to us was spotting a mama bear and fuzzy cub on the side of the road though! 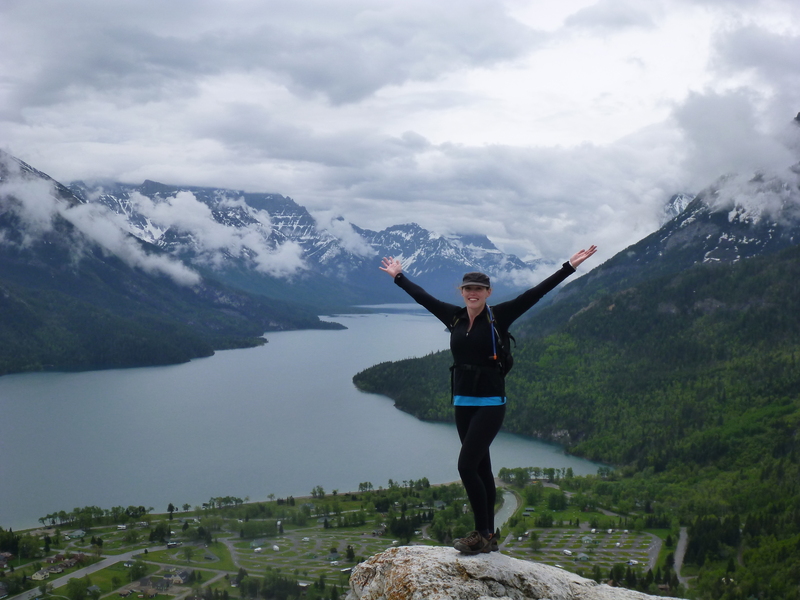 Our favourite Waterton hike was the shortest, although it was fairly steep. Bear’s Hump gives you a view over the town and lakes and after a day of drizzling rain, we were lucky that it cleared up just as we reached the top, where we were greeted by several big horn sheep. It was one of the most beautiful views I’ve ever been rewarded with for such a short hike! Bears, moose, and a tick in two entirely different sides of an enormous park. This park is BIG. We started off in Many Glacier, an aptly named area on the east side of the park not too far from the border. 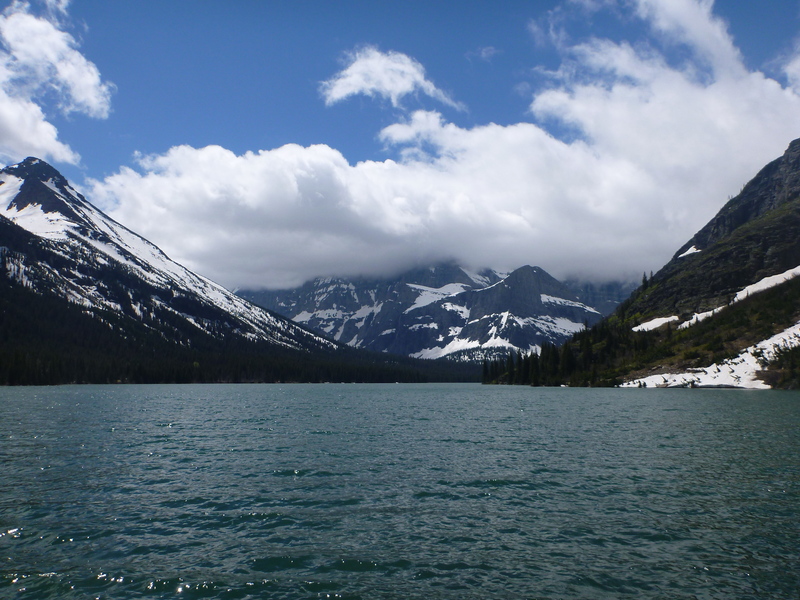 Again, driving in is a feast for the eyes, with long blue lakes and towering mountains on all sides. Since the longer hikes were still closed due to snowfall, we decided to do a bunch of smaller ones. 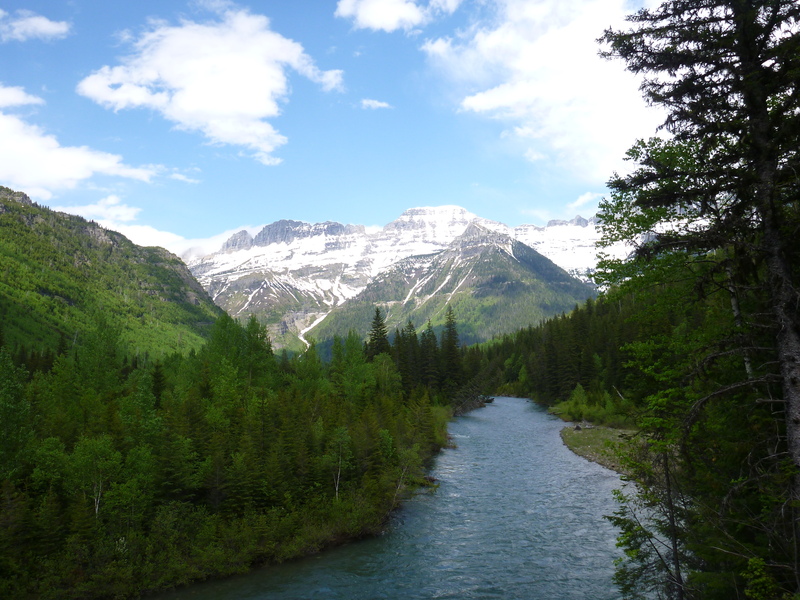 One of the best hikes was out on Swiftcurrent Trail, which led us past a raging waterfall and through an open alpine valley, before we reached Bullhead Lake. Again, it had been a fairly overcast morning, only to clear up when we arrived to the cirque lake — basically where the glacier that formed the valley would have come to a stop, which means the mountains surrounding the lake literally curve right around it. We also explored Josephine Lake, which I’m going to go ahead and say was probably the most beautiful place I’ve ever seen. It helped that the sun finally decided to come out! 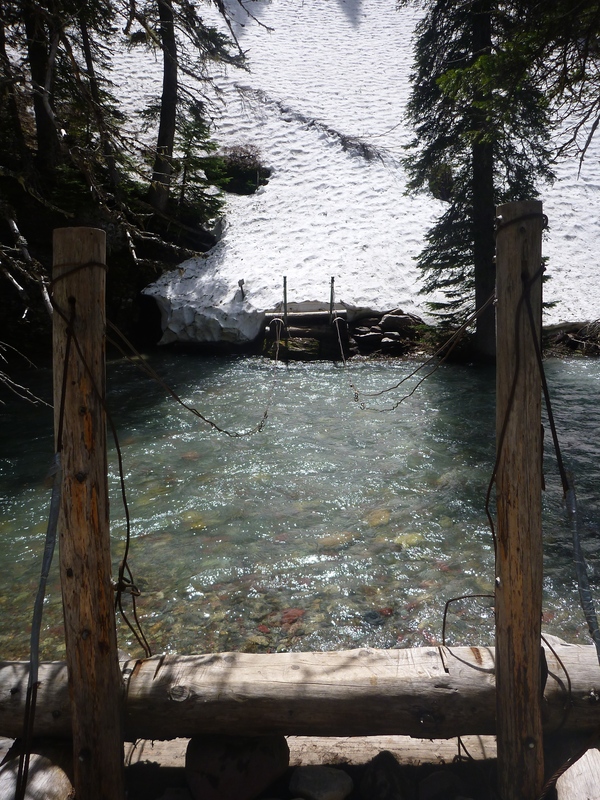 And the lake is juuuust over this bridge… oh. As always, our best wildlife viewings were by accident (and thankfully from the safety of a car). Driving around on an unsuccessful mission looking for showers near our campsite, we spotted a moose — with two little foals suckling! On our last day, driving out of the park, we once again spotted a moose right on the side, this time a male with horns. He seemed quite agitated, or maybe aggressive because we had pulled up, so we didn’t stick around very long! Then, literally minutes later, three grizzly bears RAN across the road, right in front of our car. It made me very grateful that we didn’t startle any on our hikes (we were purposefully very noisy), since those bears — it looked like a smaller female and two juveniles — were bloody fast, and disappeared in the bushes before we had time to really register what we’d seen. We had a quick stop at Two Medicine, but it was SO cold that the light rain seemed to actually seemed to turn to snow, so we decided to head back to the highway and drive around the park to the west side. The famous Going-to-the-Sun road was mostly closed, but we knew it was open from Apgar Village to Avalanche campsite on the west side of the park and hoped to explore it from there. We weren’t disappointed. 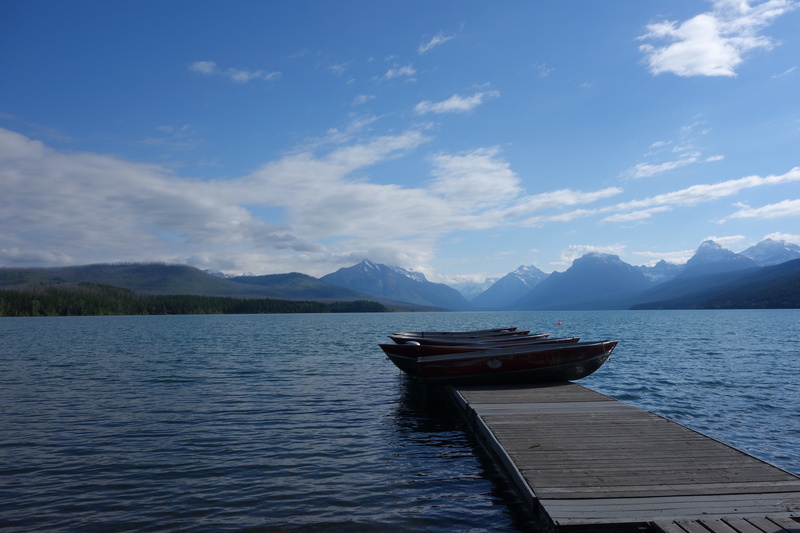 The west side of Glacier was like a metropolis compared to the much less visited east side, with small towns and even grocery stores and restaurants inside the park. The large (and very pretty) Lake McDonald provided a the backdrop for our drive to Avalanche, where sure enough the road was shut to vehicles. Thankfully, Mr Midday Musings had thought to pack our bikes, and so we began the climb up to “the Loop”, a section of the road about 13km on. It doesn’t sound far, but the road basically winds its way up a mountain, so the slow and steady incline became a very steep climb quickly. It didn’t matter though — cycling in the middle of the road as mountains and waterfalls gazed down at you, with rushing streams and the occasional hiker going past, was probably the highlight of the trip so far. The view at The Loop was amazing, but unfortunately our good camera had died and I’m not sure these photos really do it justice! As a result, I think we finished this hike in record time and with the most noise yet, basically racing there and yelling out at intervals along the way, since I really didn’t want run into a bear as the sun was setting! 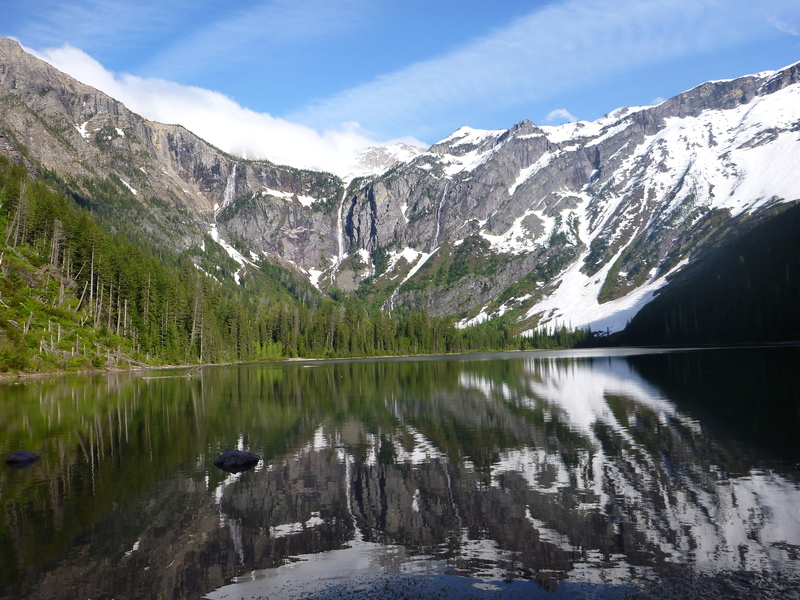 In the end, Avalanche Lake, with the afternoon sun hitting it, was spectacular — and we didn’t see any bears. That about wraps it up! Oh, so far we have had one tick (successfully removed from Dan’s chest) but otherwise happy, healthy, and excited to be moving on. Currently writing from the cowboy/college town of Bozeman, Montana and next up: Yellowstone! Cool! 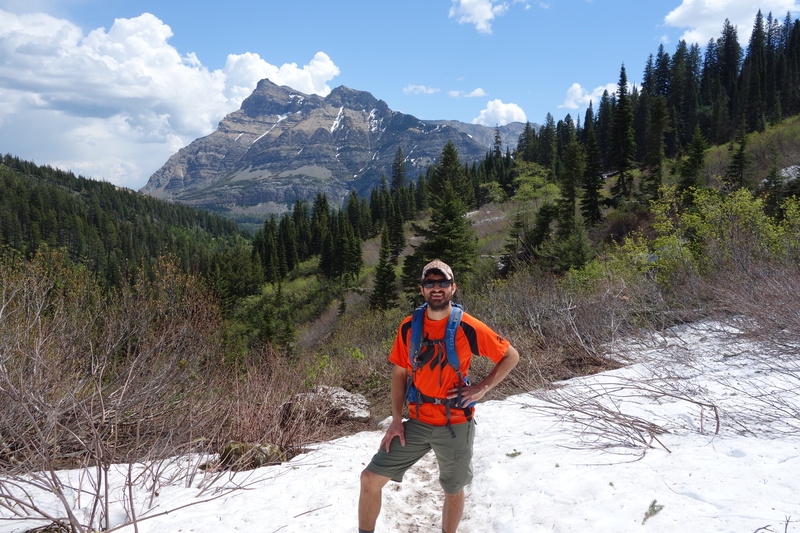 We were in Waterton NP just a few weeks ago and found the same issue with lots of snow up high. We tried to get to Bertha lake but like you guys turned around due to deep snow. The bear photos are awesome! 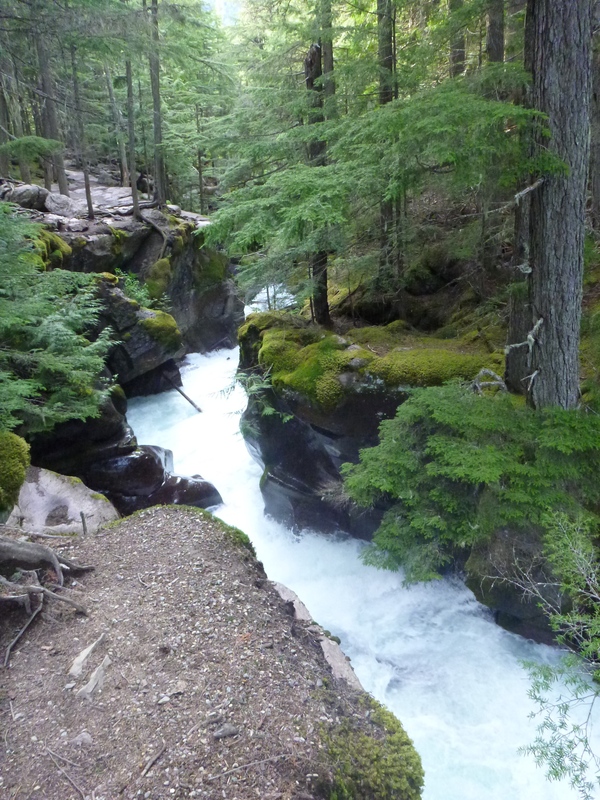 Our plan is to get to Glacier NP in August, looks like you guys had a great time. Enjoy your trip, looking forward to the next post! Stay safe!